Assisted suicide opponents are accusing Democrats in New Jersey of manipulating the legislative process to pass the controversial bill. On Thursday, the Senate Committee on Health, Human Services, and Seniors voted 6-3 to advance legislation that would allow doctors to prescribe lethal medication to patients diagnosed with terminal illnesses. The result came after New Jersey Senate President Stephen Sweeney and bill co-sponsor Nicholas Scutari, D-Union, took part in the vote despite the fact that they do not sit on the committee. The two Democrats they replaced on the committee, Gloucester Sen. Fred Madden and Essex Sen. Ronald Rice, voted against assisted suicide in 2016. The vote sparked backlash from bill opponents. Marie Tasy, executive director of New Jersey Right to Life, called the sudden switch from the majority party an "unfair process" designed to tilt the scales of the vote. "It really was stacking the deck. Obviously, they replaced what they knew were two ‘no' votes with two people they knew were ‘yes' votes," she said. "It would never have made it out of committee otherwise." Neither Sweeney, nor Scutari returned request for comment about the process used for sitting them on the committee for the vote. "The Senate President decides these assignments, and he's very much in favor of the bill," Tasy said. Rice and Madden did not respond to phone calls about the committee vote, as well as whether they continue to oppose the legalization of assisted suicide. Dr. T. Brian Callister, the governor-elect of Nevada's American College of Physicians, has led the campaign against physician assisted suicide bills in statehouses across the country. He testified at Thursday's hearing, and said it was the most "irregular" he has seen and called for an ethics investigation into the handling of the vote. "It seemed very irregular–really a charade of a hearing with the outcome apparently a foregone conclusion," Callister said. "The lack of transparency and the clear effort to silence opponents to physician-assisted suicide is an affront to our democracy at the most basic level." Supporters of assisted suicide welcomed the New Jersey committee vote. Compassion and Choices, the group that has lobbied to legalize the practice in state houses across the country, said the vote demonstrates the momentum of the movement. Seven states and Washington D.C. allow the practice, which they call "medical aid in dying," and it has seen legislative support rise in many other states. 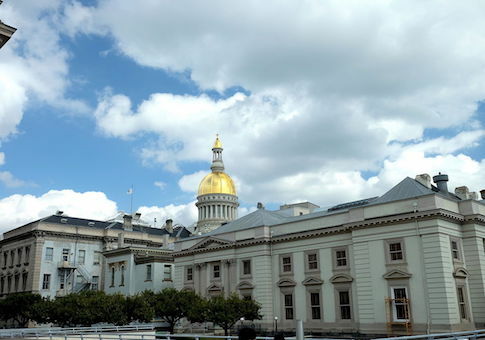 Corinne Carey, the group's campaign director in New Jersey, said the organization was "deeply grateful" to see the legislature advance the bill, which had failed to pass in previous years. "We are deeply grateful to the Senate Health Committee for responding to the vast majority of voters statewide by passing this compassionate legislation to give dying New Jerseyans the option to peacefully end needless suffering," she said in a statement. "After over six years of debate on this issue, it’s time for the Senate and Assembly to pass this urgent bill." The Assembly Judiciary Committee approved the bill in March 2018 on a 5-2 vote. Clearing the state Senate's Health, Human Services, and Seniors Committee was supposed to be the bill's last major legislative challenge, as Democrats control both legislative branches and the governor's mansion, though Gov. Phil Murphy has not revealed his position on the bill. On Thursday evening, the Senate referred the bill to the Budget Committee, which would prevent it from coming to a floor vote. Tasy said she is optimistic about making her case before that committee, as long as the majority does not use similar maneuvering to advance the bill. "There wasn't any clamor for this legislation from New Jersey–it was a well-funded outside group," she said. "Medical technology has advanced to alleviate suffering up to the point of death. This is dangerous legislation." This entry was posted in Issues and tagged Assisted Suicide. Bookmark the permalink.